Here’s another recipe with ties to Samhain. 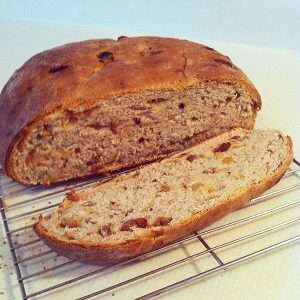 Barmbrack (bairín breac) is a semisweet tea bread with dried fruit, hence the meaning behind the name, “speckled loaf”. After reading around the Internet for a while, I am led to believe that it is properly made with yeast, partly because there are some disagreements in what I read that “barm” actually means the kind of yeast used that was derived from liquor. But as far as yeast goes, I have seen some much easier quick bread recipes out there using baking powder. Like colcannon, small objects were baked inside the bread with the purpose of telling fortunes on Samhain. Most popular was the ring, which foretold that the person who received it in their piece of bread would be married within the year. You can read more about such traditions in the colcannon recipe. If you want to bake your bread like that, I’d wrap up each item in parchment paper before inserting it into the dough, or insert them afterward. The recipe I like best both times I made it (once for my family and once for my Granddad) is from Seasons & Suppers. Because our oven is unreliable, I prefer to split the dough in half and bake two smaller loaves to ensure they bake evenly and thoroughly. In a large bowl, combine 4 cups of flour, spices, salt, and sugar. If you are using instant yeast add that now. (If you have dry active yeast, wait for the next step). Cut in the cold butter until it resembles coarse crumbs. Heat the milk in a saucepan or microwave to 110 F for dry active yeast or 120 F for instant yeast (be very careful if using the microwave, I found it heats up in less than 30 seconds!) . If you are using dry active yeast, activate it in the milk at this point. Beat the egg into the milk and stir into the dry ingredients. Mix well and knead by hand or with the dough hook of your mixer until the dough starts to come together, adding small amounts of extra flour as necessary. Drain the fruit and toss in a bit of flour to help them incorporate more easily into the dough. Knead in the fruit, adding more flour as necessary, until the dough is smooth and not sticky. Remove the dough to a large greased bowl. Cover with plastic wrap and allow to rise until doubled in size. Grease an 8-inch cast-iron skillet or baking pan (I used shaped into a round loaf and baked on a baking sheet, it held its shape perfectly). Preheat the oven to 400 F.
Turn risen dough onto a floured surface. Press lightly to release gasses, then form into a round loaf by pinching the dough underneath. Place dough in the prepared pan, cover with a tea towel and allow to rise until puffy, about 30 minutes more. Bake for 20 minutes, then check to see if it is nicely browned. If so, cover loosely with tin foil and continue to bake for 15 minutes or so until the internal temperature is 195 F. (Rather than poke a hole into that pretty brown crust, I baked it until the bottom sounded hollow when tapped.) Let cool completely before cutting into slices. Serve with tea.